My reverence for Burt Williams and Ed Selyem have led me to many spin offs such as WesMar, Brogan Cellars and Papapietro Perry who have achieved distinction with Pinot Noir on their own. Nikolai Stez owes his inspiration to Williams Selyem as well. He worked 17 harvests at Williams Selyem, and as an assistant winemaker for Burt Williams, learned from the master. Growing up on the Russian River, Nikolai was drawn to wine at an early age and began some home winemaking while still in college. He began to seriously make garage wines in 1986 and mentored at Williams Selyem. 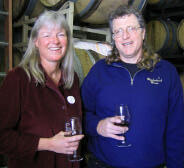 With the sale of Williams Selyem Winery in 1997, he moved on and started his own label, Woodenhead Vintners. He still has a day job, but passionately devotes all of his free time to his Woodenhead project. His domestic partner, Zina Bower, is equally passionate about wine, and is involved as well, handling the marketing and business side of Woodenhead. She also has a day job as business manager at Diamond Creek Vineyards in Napa Valley. Winemaking here is “Burgundian done in the California style.” There is no pumping, hand punchdowns are employed, a gentle basket press is used, and aging is in French oak. Through his years of contacts in the Russian River Valley, Nikolai has been able to source fruit from some outstanding Pinot Noir vineyards. When you look back on the early success of Williams Selyem, one key that stands out was the quality of the vineyards from which the wines were made. You simply can’t make great wine unless you have exceptional grapes. The Woodenhead wines I tasted recently are proof of that tenant. On his website, Nikolai writes about the frustration he has experienced in trying to get Wine Spectator and/or Steve Tanzer to score his wines. Sorry, Nikolai, no scores from me either. 14.8% alc., 273 cases, $36. This wine is a combination of several vineyards, including Buena Tierra. · This medium-bodied Pinot has restrained but promising aromas of cherry, wet earth and Christmas spice. Burgundy-oriented pinotphiles, would be attracted to this understated wine which displays subtle flavors of cherry, clove, spice and oak with a generous acid backbone and dusty tannins on the finish. 14.5% alc., 166 cases, $46. After selling Williams Selyem and retiring, Burt Williams planted his own vineyard in the Anderson Valley. He is prevented from making wine himself because of a non-compete agreement, but probably prefers not too, simply relishing in nurturing a young vineyard to excellence. Two other producers are allocated grapes from Morning Dew Ranch - Whitcraft in Santa Barbara County and Brogan Cellars in Healdsburg. · This is a prodigious wine that is as dark as Pinot gets. With coaxing, a rich nose of dark fruits, brown spice and pepper emerges. The wine is dense and chewy on the palate with oak and earth notes preempting the fruit. The finish is mildly tannic with lively acidity. It is very tight and concentrated at this point and I recommend decanting, or preferably, cellaring for a period. 14.8% alc., 193 cases, $46. This 26-year-old vineyard is “the bomb.” · This Pinot is the closest of the three to the early Williams Selyem style and is flat-out terrific. It is light in color and elegant in style. The nose-grabbing aromatics feature cherry pie and Asian spices with a hint of alcohol. The mouth feel is luxurious and the lingering finish leaves dreamy memories of spiced cherries which last until the next sip. Beautifully balanced. You will need a cold soak after drinking this one. 305 cases, $46. The Pinot Noir grapes for this wine come from 24-year-old vines, Pommard (5) and Martin Ray (37). It is one of the Anderson Valley’s heritage vineyards, the fourth planted after Edmeades, Husch and Van Hoorn. This vineyard is the closest to the ocean of any valley floor vineyard resulting in a very long growing season. 112 cases, $32. Although Humboldt County is more well-known for an illegal mood-altering substance, there are several microclimates here that are ideal for Pinot Noir. One other producer from this region that stands out is Whitethorn. Woodenhead: PO Box 1448, Forestville, CA 95436. The phone is 707-887-2703 (best time to call is Friday or Saturday). Wines may be ordered from the website: www.woodenheadwine.com.